With over 300 staff, 1600 students and campus building and networking hospitals and facilities, the University’s activities have a significant environmental impact. The Maintenance and Facilities team is responsible for managing the environmental initiatives to help us reduce any negative impact by strict monitoring of utility consumption, optimal resource utilization to ensure longer useful life of the assets and high resource efficiency. The University is committed to Environmental sustainability, which is embedded in the goals, values and strategic objectives of GMU. To support this, the university maintains a team of facility maintenance professionals with a provision in the University annual budget. Provide authentic educational opportunities for all categories of health professional students, preparing them to successfully pursue postgraduate training and continuous professional development. Develop leaders in healthcare services who can respond to the fast-growing global healthcare needs of the country and region. Advance scientific knowledge through research and discovery in the fields of biomedical sciences, population health, healthcare systems, and Medical Education. Improve primary to tertiary health care in UAE and GCC region through its ‘Academic Healthcare System, Hospitals, Clinics and Centers of Excellence’. Emphasize GMU social responsiveness and community engagement by providing affordable quality health care for different sectors of the community and promoting a healthy lifestyle. Social Accountability and community outreach. Strategic Partnerships (national, regional & international) for sustainable development. GMU is committed to environmentally friendly waste management through a proper collection of waste at its point of generation and disposal of waste as per Municipality norms. We encourage reuse and reduction of waste generation to the maximum extent. We ensure optimal utilization of resources such as classrooms, lecture halls, labs, etc. through a well-designed resource tracking system. GMU sustainability Model (People Planet & Profit – PPP) is consistent with the mission and vision of the university to ensure that the organization recognizes and delivers effectively its responsibilities towards society and environment while focusing on its objectives. Planet related objectives are achieved through compliance with environment-friendly waste management, adopting paperless practices and systems and effectively monitoring utility consumption. Periodic inspection is in place to ensure optimal consumption of water and electricity, periodic checking & analysis of generator smoke and water quality by the maintenance team to ensure an overall safe environment. We have a dedicated biomedical engineer to ensure all lab equipment are purchased, operated and maintained as per the international norms of sustainability. We use timers on the lab equipment that don’t need to be left overnight, or during specific periods of time throughout the day. The benefits of this is a reduction in energy consumption, cost, environmental impact, and often increase in the useful life of the equipment. Fume hoods use a tremendous amount of energy hence are open only when being actively used. We encourage sustainable transport system so as to achieve the objectives for reducing congestion, improved air quality and reduced carbon emissions. GMU’s transport department is committed to providing quality transportation by maintaining the highest level of safety, outstanding customer service, and positive employee relations. The team comprises of experts in the areas of safety, training and development, vehicle maintenance, routing, and public relations. This makes us confident in providing exceptional services to our students, staffs & guests, Training and Development is our core strength and helps deliver the highest quality of services. Liquid nitrogen conservation is an important energy efficiency measure because the production of LN2 is an energy-intensive Treating liquid nitrogen (LN2) cell storage containers like a freezer, minimizing the amount of time the door is open, decreases the amount of LN2 that boils off. Most frequently accessed samples are stored near the top of the rack so that they can be accessed without compromising the temperature stability of other samples on the rack, and without letting a lot of LN boil off. Freezer map and inventory are posted on the lid of the freezer and a logical storage system is maintained to minimize time with door open trying to find samples. Lid seals are checked on a regular basis to ensure that it shuts properly. GMU offers courses like Master in Public Health and Master in Environmental Health & Toxicology. Master of Public Health has been designed to meet the ever-increasing demand for healthcare professionals to plan and implement innovative Public Health Schemes and Programs at regional, national and international level. The objective of the course is to strengthen the Public Health system, and train and develop competent public health educators, researchers, practitioners, administrators, managers, and policymakers. Master in Environmental Health & Toxicology provides theoretical and practical knowledge in Environmental Health & Toxicology, seeking to determine the nature and mechanism of adverse effects of chemicals such as those found in industry, in the household, in agriculture, in medicine and those that occur naturally in the environment. Also, graduate students are familiarized with a diligent and systematic inquiry or investigation into a subject in order to discover or revise facts, theories, and applications for the benefit of the society. The Research conducted by the Master students in Environmental Health & Toxicology mostly address the environmental issues of the local community. Some of the projects are listed below. We encourage our students to participate in community outreach projects under the supervision of our faculty members. Our Community Medicine department is committed to helping the aspiring students to conduct research in various aspects of health and to present their research in the national and international scientific forum. 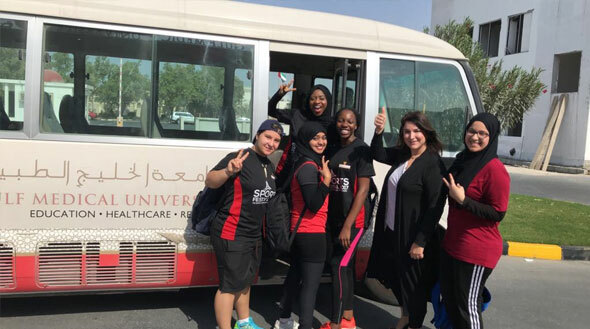 As part of the commitment to the society, faculty along with undergraduate and postgraduate students conduct health campaign and many outreach educational activities every year. The university has a dedicated community engagement committee, in which 2 members nominated from the local community to facilitate us in better understanding about the community needs and assess its impact. We encourage healthy, well-balanced and sustainable catering through our campus cafeteria. We ensure that our food items are purchased and processed under conditions that favor friendliness with the planet, animal rights and benefit the entire community. Our hospitality division manages our cafeteria and restaurant to offer the healthy and well-balanced food for our staff and students. We adopt practices to save cooking fuel by using energy efficient techniques. We also ensure maximum reduction of food waste. The Founder, President Board of Trustees of Gulf Medical University has quoted that “We consider reaching out and giving back to the society as an integral part of our corporate culture”. We have a dedicated CSR committee which oversees the CSR activities and programs at the corporate level. The committee has successfully carried out several CSR programs at various parts of the country, promoting causes and activities benefiting low-income groups, women, children, various professional groups etc. Free Medical and Dental health camps for the public led by Gulf Medical University teaching hospitals and clinics are a regular activity conducted under the committee’s guidance and supervision, benefiting thousands of people, especially blue-collared workers. The committee also facilitates scholarships and financial assistance for academically bright and financially backward students desirous of pursuing health profession education as a part of Corporate Social Responsibility. The Corporate Social Responsibility (CSR) Committee of University had launched the ‘Joy of Giving’ initiative to support needy children and bring happiness to their lives. The month-long campaign launched under Thumbay Foundation, the charitable arm that supports the CSR activities of the corporate Group, formally started on 21st July 2018 encouraged people to donate books, toys, clothes, school stationaries and painting materials for needy children and orphans. We substitute reusable products whenever it is possible. For disposable products, we consider products with reduced or recycled content packaging. We also encourage using end-of-life take-back programs, centralize chemical purchasing and keep our inventory up-to-date. We always verify energy efficient options with our vendors, while purchasing a new appliance. In case of absence of any such options, we encourage our vendors to supply more sustainable products at a competitive price. It is without question that one of the most important aspects of safe construction is Sustainability which describes our desire to execute construction activities without depleting resources or inviting harmful impacts. We ensure significant commitment to careful consumption of resources. We also demonstrate a commitment to safety by having a strong corporate safety policy, we also develop “site-specific safety plans” tailored to meet the needs of the specific projects. We further have a dedicated Quality Assurance/Quality Control program which is reviewed and updated frequently in order to maintain the highest standards of quality in construction. We have received 5-star ratings from QS (One of the leading global university ranking organizations) for environmental sustainability and Inclusiveness and 4-star ratings for facilities. We have received the prestigious Sheikh Khalifa Excellence Gold Award and Dubai Quality Appreciation Award for inculcating international best practices in Institutional Quality.